Acidic waters from Cement Creek discharge into the circum-neutral Animas River in a high-elevation region of the San Juan Mountains near Silverton, Colorado. Cement Creek is acidic and enriched in metals and sulfate because it is fed by discharges from abandoned mines and natural mineral deposits. Mixing with the Animas River raises the pH and produces precipitates of iron and aluminum (oxy)hydroxides, which in turn can adsorb other metals. This confluence was studied in 1996 and 1997 to better understand mixing and sorption processes which are common during the neutralization of acidic streams. The photographs in this report show flow braiding and other features that influenced the way the two streams mixed during the late summers of the two years. They also show "banding" due to incomplete mixing and "opalescence" due to chemical reactions and the formation of colloidal-size particles in the mixing zone. The upper Animas River drains an extensively mineralized caldera in the San Juan Mountains near Silverton, Colorado (Yager and Bove, 2002). This is an area of complex geology, high elevations, and a long history of mining primarily for gold, silver, zinc, and lead. Although the mines are no longer active, discharges from them and from natural mineral deposits directly affect the chemistry of the creeks that drain the caldera (Church and others, 1997; Kimball and others, 2002). Cement Creek is acidic and enriched in metals and sulfate when it flows into the Animas River near Silverton, Colorado. Inflow from the circum-neutral Animas River is typically three- to four-times greater than the inflow from Cement Creek (Schemel and others, 2000). Consequently, the pH of the mixture downstream from the confluence is much higher than that in Cement Creek. This results in chemical conditions where (oxy)hydroxides of (ferric) iron and aluminum are no longer soluble and form colloidal-size particles (Schemel and others, 2000). These particles are powerful sorbents of many trace metals, and in turn can strongly influence the water chemistry and downstream transport. Studies of colloid formation and chemical reactions and transport were conducted during the late-summer periods of low flow (base flow) in September 1996 and 1997 (Schemel and others, 2000). Discharge levels were similar during the two study periods; however, there were substantial differences in the ways the two streams mixed. 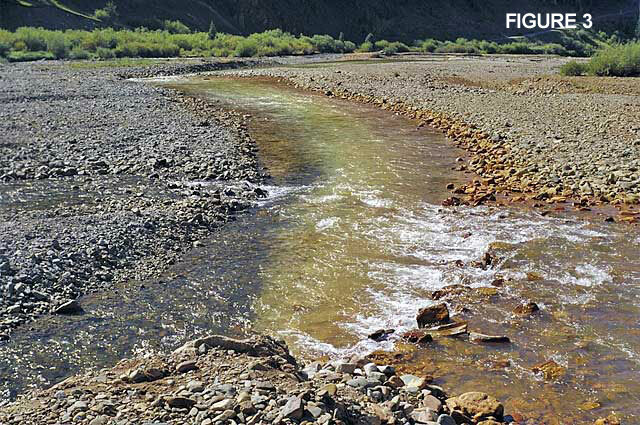 The purpose of this report is to present photographs that show the distributions of braided flows from the upper Animas River and the ways they entered the mixing zone during the two studies. These photographs also show intensely colored "banding" due to incomplete mixing, the formation of precipitates, and coating of the substrate, as well as "opalescence" in the water column due to the colloidal size of the particles formed by the chemical reactions. 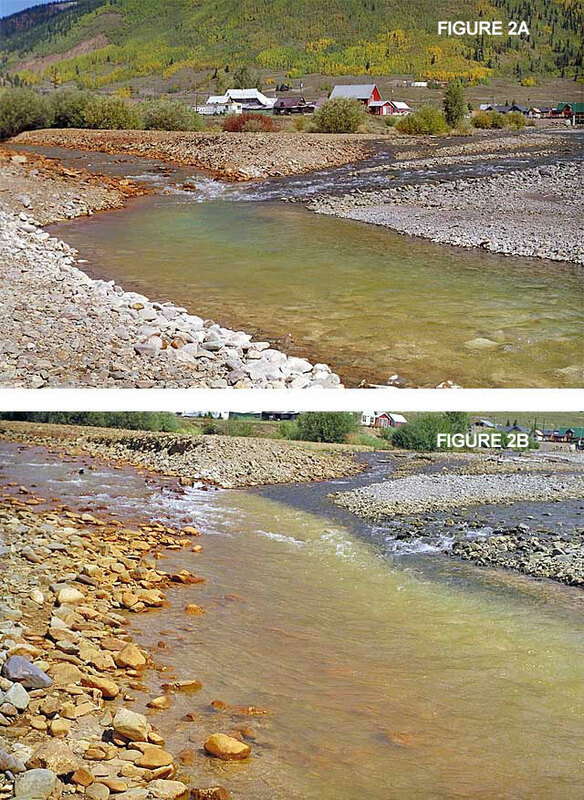 Figure 1 shows photographs of the Cement Creek-Animas River confluence and the network of channels downstream during late summer 1996 (A) and 1997 (B). Discharge from the upper Animas River flowed under the bridge at the location of the Animas River gage (shown in A). In both years, the river formed two main tributaries below the gage. The left-side (of the photograph) tributary discharged directly to the (primary) confluence with Cement Creek, and the right-side tributary flowed to locations downstream from the primary confluence. Most of the flow from the right-side tributary was carried by a channel (far right) around the area labeled "Mixing Zone" (Figure 1A) and the network of channels immediately downstream. Therefore, a secondary confluence of Animas River inflow with partially mixed waters from the Mixing Zone was located at bottom of the photographs shown in Figure 1. Consequently, complete mixing of Cement Creek with the Animas River occurred over several hundred meters in both years. In 1997, however, additional braiding of discharge from the Animas River was evident between the two main tributaries identified above. In addition to the left tributary, one braid discharged near the primary confluence with Cement Creek, and two additional braids discharged to the Mixing Zone downstream (Figure 1B). The distribution of inflow from the Animas River in 1997 neutralized inflow from Cement Creek in a more gradual fashion than had been the case in 1996, which preserved and intensified the across-channel gradients in the Mixing Zone that are described below. Figure 2 shows details of the confluence of Cement Creek (left inflow) and the Animas River (right inflow) in 1996 (A) and 1997 (B). Rocks that line the bank of Cement Creek were red because some (ferric) iron precipitated even at the low pH. The Animas River inflow was clear and the bank was not coated because concentrations of metals that would precipitate at its circum-neutral pH were relatively dilute. Mixing of the two streams resulted in the formation of colloidal particles of both iron and aluminum (oxy)hydroxides. The "opalescence" in the water column of the Mixing Zone was due to light refraction by the colloids. Precipitates coating the left-side bank of the Mixing Zone were iron- (red) and aluminum- (white) rich mixtures. In the Mixing Zone, red precipitates were found nearest the confluence (Figure 2B), but white precipitates generally dominated farther downstream (Figure 2A). As shown in both photographs, the water column was clear near the right-side bank and the rocks were not coated because the two source waters were not well mixed across the channel. 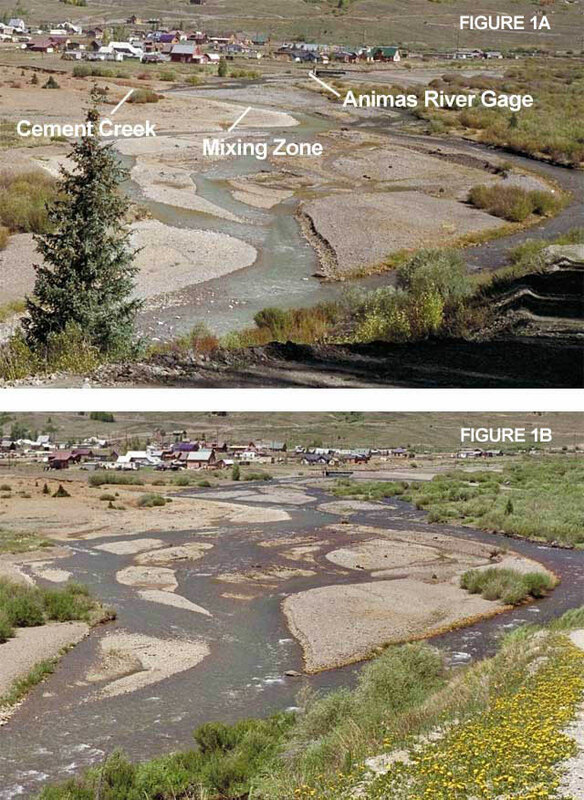 Figure 3 is a view of the Mixing Zone looking downstream from the confluence of Cement Creek with the first two inflows from the Animas River in 1997. It clearly shows the lack of coatings on bank rocks nearest the Animas River inflows and red coatings on the right-side bank, nearest inflow from Cement Creek. Although distinct banding was apparent in the Mixing Zone waters, this effect was primarily the result of coatings on the substrate. Red coatings near the right side indicated iron-rich precipitates, which can form at a pH lower than the pH range where aluminum precipitates. In mid-channel, white coatings indicated aluminum-rich precipitates formed as the pH was raised by mixing with the Animas River. The presence of additional inflows (braids) from the Animas River in 1997 preserved the banding pattern much farther downstream than was the case in 1996. The photographs presented in this report provide visible evidence of chemical gradients across the channel in the Mixing Zone and pH-dependent chemical reactions involving metals that were supplied to the confluence primarily by Cement Creek. In addition, they illustrate significant year-to-year differences in the ways these two streams mixed due to changes in the streambed and channel braiding. Church, S.E., Kimball, B.A., Fey, D.L., Ferderer, D.A., Yager, T.J., Vaughn, R.B. 1997. Source, transport and partitioning of metals between water, colloids, and bed sediments of the Animas River, Colorado. U.S. Geological Survey Open-File Report 97-151. Kimball, B.A., Runkel, R.L., Walton-Day, K., Bencala, K.E. 2002. Assessment of metal loads in watersheds affected by acid mine drainage by using tracer injection and synoptic sampling. Applied Geochemistry 17: 1183-1207. Schemel, L.E., Kimball, B.A., Bencala, K.E. 2000. Colloid formation and transport through two mixing zones affected by acid mine drainage near Silverton, Colorado. Applied Geochemistry 15: 1003-1018. Document Accessibility: Adobe Systems Incorporated has information about PDFs and the visually impaired. This information provides tools to help make PDF files accessible. These tools convert Adobe PDF documents into HTML or ASCII text, which then can be read by a number of common screen-reading programs that synthesize text as audible speech. In addition, an accessible version of Acrobat Reader 5.0 for Windows (English only), which contains support for screen readers, is available. These tools and the accessible reader may be obtained free from Adobe at Adobe Access..